Congrats to Sarah, who will be recognized at the Graduate College Office of Diversity, Equity & Inclusion’s “Celebrating Diversity, Recognizing Excellence” Ceremony! 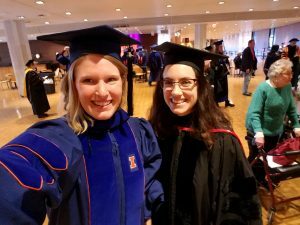 I had the honor of hooding Melinda, the first PhD from the Conroy Lab, in December. New MS student Nicole Murray joined the lab in Fall 2018. Nicole has a BS in Animal Sciences from UIUC and a BS in Earth and Space Exploration from Arizona State. Welcome Nicole! Allie Bruegger’s MS published in Geology! Our paper (w co-advisor Brandon Curry) is just out in Geology this week! Melinda’s paper was just published in Paleoclimatology and Paleoceanography! Galápagos precipitation isotope paper out! Hurray, Nick’s paper was published in JGR-Atmospheres! My group’s research in Kiritimati was highlighted on the website Academic Stories. The Conroy lab is sprinkled across several sessions at AGU 2017 in New Orleans. I’m co-chairing the Water Isotope Systematics sessions this year, with talks in the morning and posters in the afternoon of Friday, December 15th. Here’s our schedule, stop by and say hi! Wow, I made it into this article in the Guardian as a ‘rising star’ in climate science. Pretty cool.